Just a few photos from the 4th annual County Rail Planting Party! Thanks to all our friends and members who showed up for our annual Planting Day on Sunday! We got a ton done and we loved having all of you up to the farm. AND thanks to our volunteers on Tuesday – the asparagus is looking mighty fine. This year each variety is labeled in the field so we know for sure what when we’re harvesting (… the things we learn). 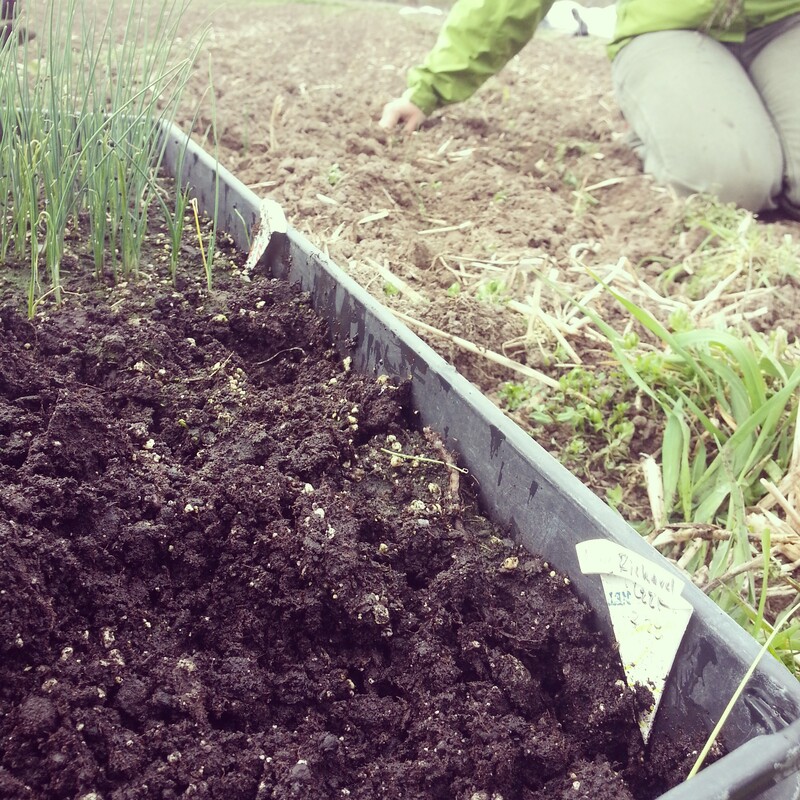 Emily and Robin planting Calibra onions in wide beds that have been tilled and (mostly) weeded. 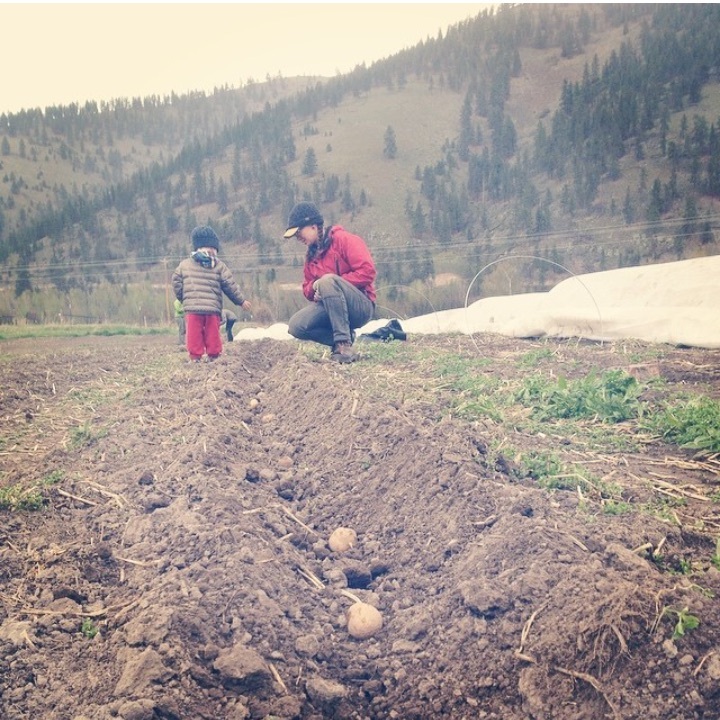 Tate (with baby Aloura), Kisha, and Mila were rock stars planting almost all our potatoes. Yvonne, Nancy, and Lindsey in the onions. These ladies planted all our leeks as well! Purrseus being helpful as usual, overseeing the planting. Garlic, beets, joi choi, chard, cabbage, and lots of other fun things in our early beds. 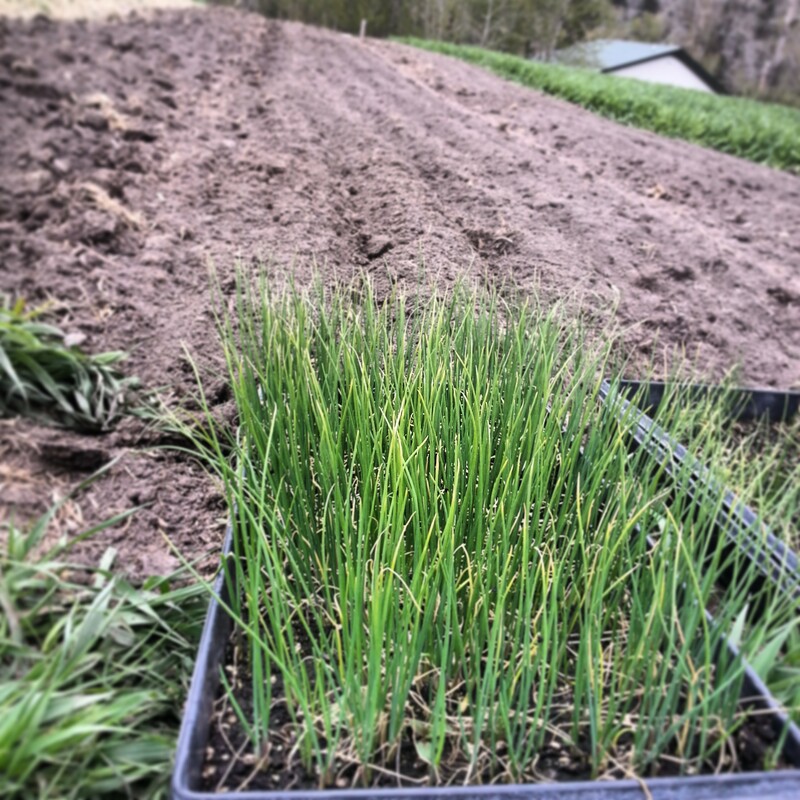 A few of them ready for harvest this week – come to the first Clark Fork Market this Saturday and see them featured at our stand! Sunday we had 15 people (that’s including two sets of children!) out to the farm for a work day. It was sunny, warm, and summery… if it weren’t for the gusts of wind every 20 minutes the weather would have been perfect for the farm party. We planted all of our onions (see below!) and all of the potatoes. 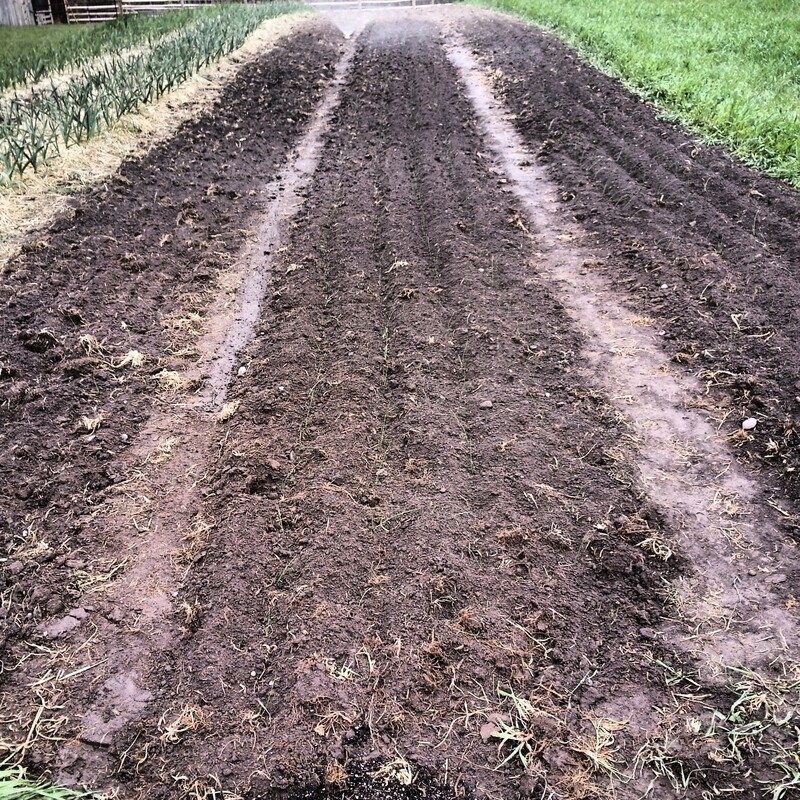 We even weeded a good chunk of the asparagus patch, which very badly needed it. The kids were instrumental in getting the work done, and we wouldn’t have had nearly as much fun without them! I wish we had more pictures of the process, but we got distracted visiting with our members and enjoying their company! Thanks to everyone who came up this weekend – we had such a great time even with the wind! If you couldn’t make it, we’ll have other work parties. In fact, I enjoyed it so much I’m already thinking about the next one. About a month from now? Who’s in?! 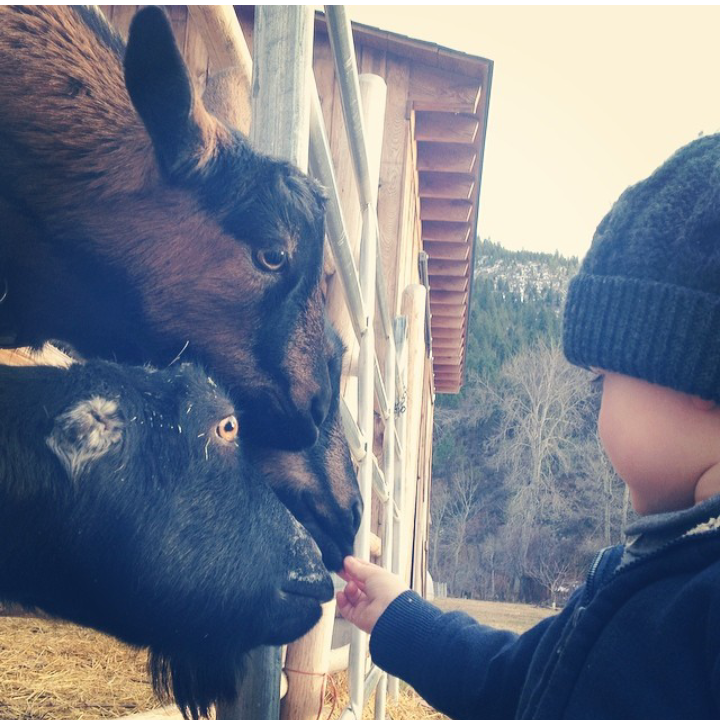 We’re always down to have you come to the farm and help us out – there are always weeds to pull and often more exciting things happening. Don’t be shy! Tirza, Yvonne, and Dave in the asparagus! You’re troopers – thank you! Andy and Amanda planted all of the potatoes single handedly (dual-handedly? )… you two rock! Morgan, Andy, Beth, and Amanda. Thanks to Morgan and Beth we had not only delicious brownies but a lesson on chicken breeds! Morgan says our broody hen is really close… chicks coming soon! !